Often, software hackers are the activists that push software giants towards updating vulnerable applications. 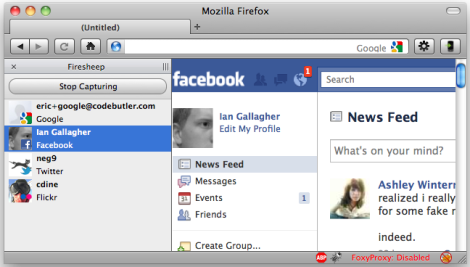 In todays example, [Eric Butler] is pushing Facebook, Twitter, Flickr, and more all at the same time. By creating a user script-kiddie friendly extension for Firefox, he has allowed just about anyone to sniff unsecured connections on public Wi-Fi access points and log into these unprotected accounts. Right now the extension is available for Windows and Mac, with a Linux port coming soon. Temporarily, the best way for a user to avoid getting taken advantage of would be to not use these social networking sites on a public connection, or to implement a secure proxy for these connections that would keep your data safe. Hopefully these websites will have a quick rebuttal that allows for security without workarounds. With all of the bad press they are recieving, they certainly have incentive to. Are there any software or security buffs out there? We would love to see someone port this to an iPhone or Android app that could check and log open Wi-Fi points. We’ll leave the foot work to the experts out there, but do be sure to give us a heads up if anyone manages to make it happen, okay? [les robots] had a defective Eye-Fi card on his hands and when a replacement was sent, he was told to destroy the original. What better way to ‘destroy’ something than opening the case? The Eye-Fi is an SD card with a builtin WiFi radio so it can upload images while remaining in camera. One version uses Skyhook’s location service to geotag photos. You can see a few photos of the dismantled card on Flickr. The board is manufactured by Wintec. The wireless side is handled by Atheros’ ROCm, the same low power Radio-on-Chip module you would find in a mobile phone. The flash memory comes from Samsung and the antenna is along the back edge, where it has the best chance of getting signal. The RepRap project has made heavy use of the Solarbotics GM3 Gearmotor as part of their extruders. Unfortunately they’ve proven to be underpowered for the task and the plastic gears could cause future problems. [Zach] decided to investigate some other options. He bought a pile of motors from Kysan to try out. He posted a teardown of one of the motors on Flickr. He found it not only easy to disassemble, but the metal gears were also easy to put back together. Next up is testing it on the machine. Maker Faire Austin has come to a close, which means it’s the perfect time to start checking out photos from the event. Pictured above is SparkFun’s Picture Frame Tetris. You can see this and many other pictures on Flickr. Let us know what you thought of the event in the comments. [danwagoner] recently completed a restoration of his very first electric guitar. Instead of going the normal route, he modded it to be a Weird Sound Generator. The WSG is a popular kit sold by Music From Outer Space. His creation, dubbed Fender Bender, has a custom pick guard cut from an old motherboard. There are multiple knobs on the pick guard plus three buttons on the neck.